Utilities are in a time of transition. Legacy communications circuits are being discontinued by carriers and there is pressure for utilities to move to new packet-based services. In addition, much of the new smart grid applications and products that are being introduced by vendors are based on Ethernet, adding to the pressure to modernize networks. Packet technologies—Ethernet and IP, for network layers 2 and 3, respectively—are the next evolution of the utility network. Here are 10 key points for utilities to keep in mind while they consider the jump to packet technology. Malcolm Loro is Director of Market Development and Consulting at Ciena, with a focus on Enterprise markets. Over time, the proliferation of analog and TDM device protocols has led to complex environments made up of multiple application-specific, proprietary networks, with information siloed between operational areas. Ethernet data transport isn’t tied to any one specific client protocol, so it’s easy to add different types of services over a common network infrastructure. 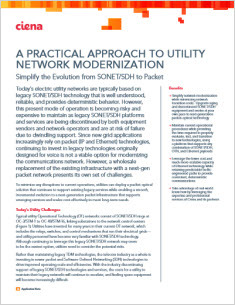 The key to modernizing grid communications is to provide a common, multi-service network infrastructure for the entire utility organization that will then provide operational efficiency benefits, visibility, and functional integration of operational information across grid applications and data networks. Ethernet also allows for the convergence of IT and OT – with enterprise applications (the IT) and operations running the grid (the OT) working together, utilities can benefit from increased efficiency, and better support disaster recovery and business continuity efforts. Historically, utility traffic signals haven’t taken up much bandwidth, so capacity hasn’t been a big concern. However, this will change as new smart technologies are introduced in increasing numbers. High-definition video for physical surveillance and more sophisticated (and numerous) sensors and smart grid applications will lead to a significant growth in traffic on the utility network and drive unpredictable spikes in bandwidth demand. Packet technologies provide the on-demand capacity and scalability required for both scenarios. Legacy systems in use today are either becoming obsolete or are no longer being supported. With heavy investments still pouring in, and adoption continuing to rise, Ethernet technology will live on for the foreseeable future: Ethernet 10G and 100G service revenue is expected to grow overall by 300% by 2018, according to a 2014 Infonetics report; and both Ethernet and IP were being used in some capacity by at least 70% of utilities as of 2013, a number expected to climb to 80% in 2018, according to GTM Research. Much of the traditional utility applications like grid monitoring, control, and protection are being redesigned with newer IP and Ethernet-based technology. As utilities plan for smart grid applications and legacy systems become obsolete, a prudent strategy is to systematically migrate to newer, packet-based systems. By adopting an Ethernet-based communication network infrastructure, utilities will be able to assure compatibility with new equipment and applications. If a fault occurs in the transmission or distribution system there could be damage to expensive electrical equipment, danger for utility personnel and the risk of service interruptions and regulatory penalties. Teleprotection systems are vital for stopping the propagation of a blackout and damage throughout the grid. They allow for communications between substations and the selective disconnection of faulty parts of the power system in order to isolate the fault. Traditionally, teleprotection networks were built to be deterministic—data transmission time, resiliency and recovery times are precisely controlled for the connections that are used to transfer commands between relays. While it’s tempting to hang on to legacy TDM systems, Ethernet can be engineered to provide the same deterministic, low-latency behavior utilities are used to. While teleprotection is perhaps the most vital application utilities require for their networks, Ethernet can handle the traffic from other key applications such as SCADA for grid monitoring and control, voice and video data for physical safety and security, enterprise business applications, remote field access and backhaul for smart metering. Notably, with an Ethernet network, utilities can converge those applications onto a common network infrastructure and streamline management of those systems. IEC 61850, is an important international standard for electrical substation automation design that is having a significant impact on how utility power systems are designed and promises dramatic improvements in the costs and performance of these systems. In keeping with the general migration to packet technologies, IEC 61850 communications are based on TCP/IP and Ethernet.By working with the IEC 61850 standard, utilities can take advantage of features and benefits including dramatic reduction in wiring, fast peer-to-peer communications, device modeling and reporting schemes and access security capabilities. While the transition to packet technologies can seem daunting, utilities have the option of phasing the technology in gradually, eliminating the risks of a rip and replace strategy. It doesn’t have to happen all at once – employing a ‘converged packet optical’ approach allows utilities to migrate applications and technologies at their own pace, and for legacy technologies to be phased out over time. This helps utilities to ease into the transition, while preparing their networks for the future of the industry. While the switch from legacy to packet technologies will require a significant investment, the obsolescence of legacy equipment and protocols is creating an urgency to ensure the continued safe, reliable delivery of electricity. Fortunately, the benefits and associated savings of packet technologies will ultimately far outweigh the upfront costs. These costs will be offset by savings from unified network management (not needing to dedicate separate resources to separate siloed networks), the inherently cheaper nature of Ethernet switching, and the fact that, because Ethernet is based on industry standards, utilities won’t be locked into more costly proprietary protocols and technologies.